§ 12 Responses to About"
It’s funny how your experiences during childhood can make such an impact on a person. Yeah, cooking and traveling are pretty good things to get from your childhood. Hi Joann – I love your site and the name is so original and cute at the same time – congrats! Thank you. There were a few names in the running, but chickypea was the only one that stuck. after a week like we just experienced….it is relaxing and encouraging to see natural beautiful and tasty food. it looks delicious…mr photografia better watch his back……you got the touch! I’m glad you approve. It’s a lot more work than I originally thought, but I’m learning a lot through the whole process. Hopefully it will make me a better cook, designer and improve me photography abilities. This site is amazing. Great job! 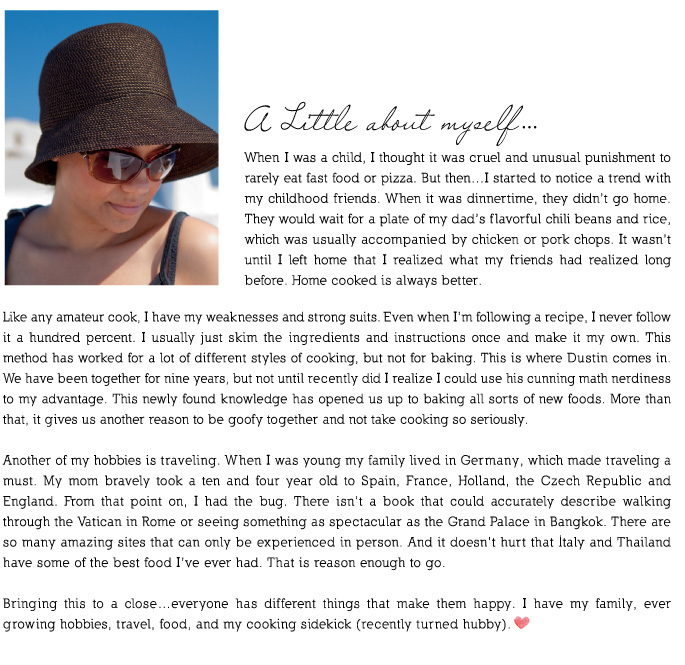 My name is Leah Rodrigues and I am a contributing editor on Foodista.com. We featured your recipe for Tempeh Sloppy Joe’s on our website. The post included a photo (crediting Chickypea) with a link to your website for recipe instructions. I did not see a copyright stamp or disclosure on the blog. If for any reason you would like me to delete the post, let me know as soon as possible. Thank you for the note. I love when my recipes are passed around. That is what the internet is all about, it’s like one big exchange of ideas. Thank you for crediting Chickypea. can you tell me which program you use for the fonts? especially on the “southern style tempeh” picture? Hello. I use photoshop and illustrator. The fonts are Bebas and Carton. Everyone has different things that make them happy. I have my family, hobbies, travel, food, and my cooking sidekick hubby. All of these come together here.